I am writing you to ask how much history you know about the First Bank established in Kensal? My Great Grandfather, LeRoy David Thayer (Roy), was the owner of the bank. 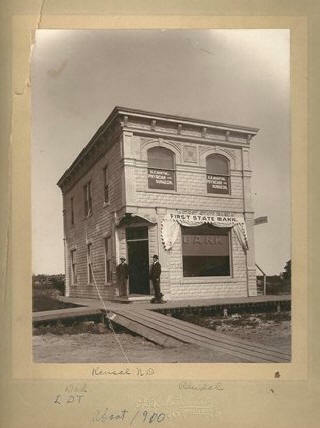 We have some historical pictures of the bank with him and the cashier. There is one taken inside and one outside. It appears that it stood on cement blocks with a wooden sidewalk going around it. He also owned a bank in Clarissa Minnesota, and lost both during the depression in 1928. Please email myself or my father, David Thayer, with any information or questions you have.